Tachyon is known worldwide for top-shelf frame rate conversion capabilities, but it is also used to make killer progressive frames from troubled source (broken cadence patterns, interlace artifacts, etc.). 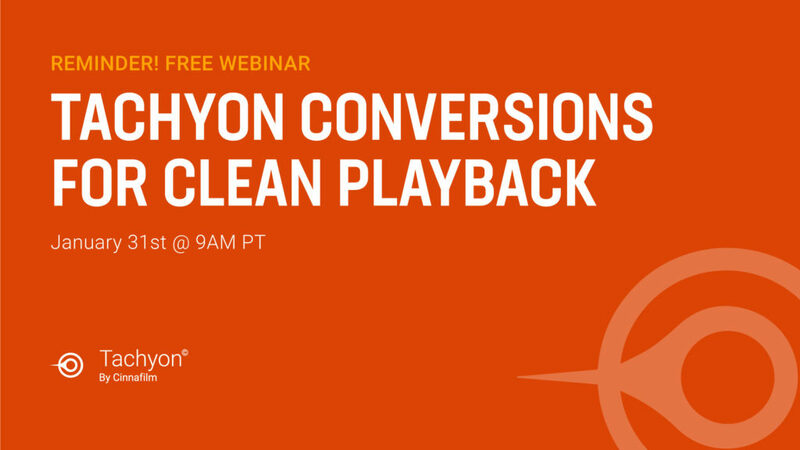 Join us for a brief, focused webinar, where we will demonstrate how to effectively use the Tachyon converter to quickly make amazing quality video – a critical solution for the growing OTT market. Check out Tachyon Conversions on Vimeo using password “Tachyon2019” to see examples exclusive to this webinar. We will be demonstrating using the new pay-as-you-go cloud service, PixelStrings, which includes Tachyon. Tachyon users will recognize the commands as identical to those they are accustomed to. We will also show how to use the Tachyon tooltips. Webinar attendees will receive a $25 credit to PixelStrings, giving them access to all of Cinnafilm’s technology in the cloud, by the minute.